We also know that people are hard-wired to seek out and pay attention to things that are rewarding, such as food when we are hungry, or water when we are thirsty. According a team of neuroscientists at Johns Hopkins, the answer is “yes,” especially when those things previously have been associated with something rewarding, such as money. 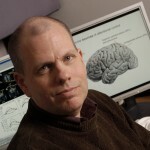 In a paper published this week in the Proceedings of the National Academy of Sciences, a team led by Steven Yantis of the Department of Psychological and Brain Sciences found that test subjects who were completing a visual search task were distracted when items that had previously been associated with small amounts of money occasionally appeared. The results have implications for understanding how the brain responds to rewarding stimuli, which may contribute to the development of more effective treatments for drug addiction, obesity and ADHD, said Yantis, of the Zanvyl Krieger School of Arts and Sciences. Steven Yantis/Photo by Will Kirk/Homewoodphoto.jhu.edu. In the study, people first searched for red or green circles in an array many differently colored circles displayed on a computer screen. One color (for instance, red) was always followed by a monetary reward (10-cents) and the other (perhaps green) by a smaller reward (one cent). After doing this for more than an hour, the study subjects then were asked to search for particular shapes (for instance, a circle among diamonds) and color was no longer relevant or rewarded. Still, occasionally, one of the items in the display was red or green. When that happened, the study subjects’ responses slowed down. According to Yantis, this proved that an overwhelming number of people in the study became distracted by the red or green objects, even though the study subjects had been instructed to ignore those items and the items were inconspicuous and had no relevance to the task at hand. “It was clear to us that those red or green items had become valuable to the study subjects, because they were linked in their minds with a reward,” Yantis said. In addition, the study subjects also completed a questionnaire measuring impulsivity. The team found that people who were more impulsive to begin with were even more prone to distraction by the “high value” red or green objects. Brian Anderson, a graduate student in the Department of Psychological and Brain Sciences, and Patryk Laurent, a post-doctoral student in the same department, co-authored the study.